The State of Hawaii is filled with amazing natural beauty. It has extraordinary flowers like: hibsicus, ginger and anthuriums. It has rare creatures like the Hawaiian Hawk and the Hawaiian Bat. And it has incredible natural wonders like valleys, mountains and waterfalls. Volcano is a small village on the Island of Hawaii, where the Kilauea Volcano is located. If you pay a small fee, you can visit the Volcano National Park. The park has a number of magnificent attractions including Halemaumau Crater, the Jagger Volcano Observatory and the Thurston Lava Tube. Where else can you walk across the bottom of a volcanic crater, see steam pouring out of the earth and cruise through a lava tube? You can also have lunch at the Volcano House Restaurant, which over looks a gigantic crater. Mauna Kea is a mountain on the Big Island that is home to many of the best observatories in the world. Situated in the middle of the Pacific it has some of the cleanest air in the world and is an excellent location for peering into the outer reaches of the universe. Measured from its base, at the sea floor, it is taller than Everest. Mauna Kea is frequently covered with snow, a rare sight in on a tropical island. From its summit you can see the whole island. 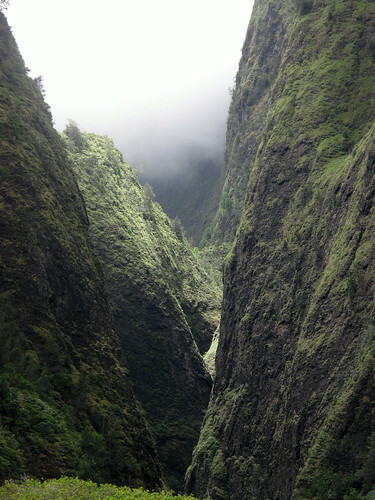 In the Iao Valley of Maui, you will find the Iao Needle. It is a massive 2,000 foot tall stone column that is covered with vegetation. Way back in 1790, the valley was the sight of an important battle that led to the unification of the Hawaiian Islands. This monument in the verdant Iao Valley was once used by the ancients an altar. Right outside the quaint village of Honomu, you’ll find Akaka Falls Park. It is home to a towering, 400 foot waterfall called Akaka Falls. When you enter the park, you will be awed by the majestic beauty of the tropical jungle that surrounds the falls. You will hear many native birds singing and you will see quite a number of native trees. When you reach the end of the short trail to the falls, you will be overwhelmed by the roar of thousands of gallons of water rushing over the falls.